Regular readers will know that over the past twelve month I have been presented with all manner of cakes. 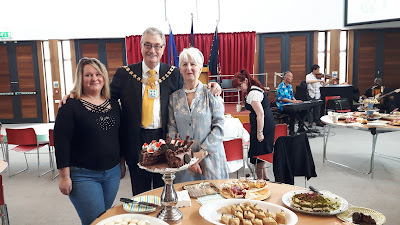 I have been greatly impressed by the range of home baking that local groups have produced. I found that I was holding a competition in my mind as to who was the best. As my term of office draws to a close I think it is time to declare a winner. For a long time Maghull Baptist Church led the bake off. Highly commended goes Clarence High School, Age Concern Crosby, St Luke's Crosby, the amazing Guinness Cake at Mrs & Mrs Fletchers whose home was open as part of the National Garden Scheme, Grosvenor Rd URC Birkdale and the MacMillan Coffee Morning in Marshside. But the undoubted winner was the 'Cakes of the World' celebration held by the Migrant Workers' Community this weekend. Congratulations to Eileen Saunders and her team, pictured above with their star baker, they produced an amazing spread. There were cakes from all over Europe. The quality and diversity of baking eclipsed all other events. Students from Edge Hill University helped put on the event and they have promised me some of the photographs they took which illustrate the brilliant bakes and which I shall add to this posting. The cakes demonstrate the enormous and diverse contribution that the migrant workers make to our community. In every generation people have moved to our town and they too have enhanced our society by their hard work and cultural impact.